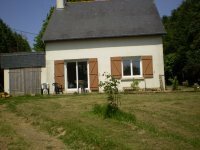 HOLIDAY HOMES TO RENT IN COTES D'ARMOR, BRITTANY. Welcome to our selection of holiday homes to rent in Cotes d'Armor, France. The departement of Cotes d'Armor is located on the northern coast of Brittany on the English Channel. While visitors might not think of this area for a seaside holiday, there are in fact several beaches and pleasant holiday villages in this part of France, as well as some spectacular coastal scenery. As in most other parts of Brittany, there are lots of medieval and older towns and villages should your plans for sunbathing fall prey to the notoriously unpredictable weather in this area. Located in the west of Cotes d'Armor, the stretch of coastline between the pleasant villages of Trebeurden and Perros-Guirec is called the �Pink Granite Coast� because of the unusual and distinctive colour of the cliffs in this area. The entire coast is beautiful, but there is one part in particular that should not be missed; the Ploumanac'h rocks, a jumble of warm, pink rocks of different shapes and sizes, piled up at the water's edge and at the base of the cliffs. Some have even been shaped into unusual forms by erosion, taking on the appearance of animals or inanimate objects. In order to preserve the area for future generations, visitors are asked to keep to the marked footpaths to prevent further erosion of this unique attraction. Further east, visitors will come to the Sillon de Talbert, a remote and exposed spit of sand that stretches three kilometres out into the English Channel. On windy autumn days, the walk to the end can be very cold, but on pleasant summer days, the view out to sea and the sheer number of sea birds in the area make the walk enjoyable and interesting. In the far east of Cotes d'Armor is the Emerald Coast, named for the green colour of the sea in this part of Brittany. At one end is the pleasant town of Val-Andre, with the magnificent viewpoint on the Grouin headland at the other. A coastal path runs the entire length of the Emerald Coast, allowing visitors to see from above how the colour of the water changes. One of the highlights of the walk is the 14th century fort of La Latte which overhangs the English Channel, 60 metres up! A short distance inland is another fortification, the 13th century Hunaudaye castle, with five large and impressively maintained towers, while the medieval town of Dinan, with its narrow cobbled streets, half-timbered houses and tourist shops and cafes is a great place to spend a rainy afternoon. Looking for self catering holiday accommodation in Cotes d'Armor? 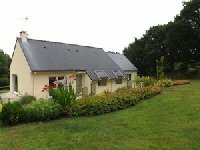 Then below is a selection of gites in Cotes d'Armor and villas in Cotes d'Armor that can be rented direct from their owners. You can either click on each listing for further details or you can use our search engine on the left if you are looking for something in particular.